As @dinodaizovi nicely put on twitter, CTF team Plaid Parliament of Pwning have gone from winning everyone else's CTFs to hosting their own, namely the plaid CTF or pCTF (@pctf2011). It was 48 hours of intense challenge-based CTF like Defcon quals. As you can see on the final scoreboard, more than 400 teams registered and 155 teams scored points. Since I no longer play with Nibbles guys, this time I played with a new team called CoP. 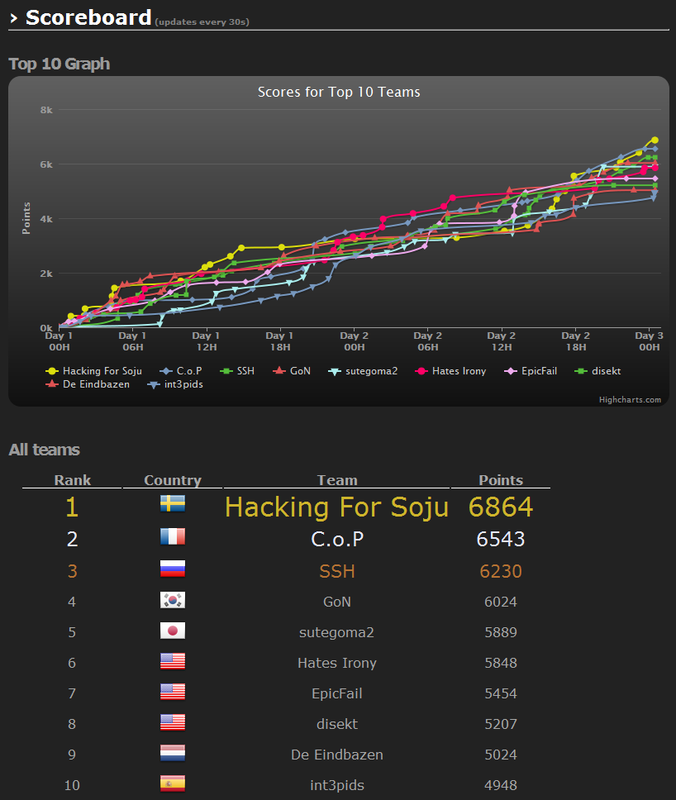 We got the 2nd place, 1st place being taken at the last moment by our CTF friends HFS (Hacking for Soju). Good game, it was intense! Congratulations to everyone for playing, and especially to PPP members who made this CTF possible. Very good challenges, organization, and IRC presence for support. You pwn guys! If you want to have a look at the challenges, I mirrored them here (except remote/web of course), along with screenshots of problems, scoreboard, etc. CoP did an amazing job! Thanks for pwning our challenges. See you at the next CTF!